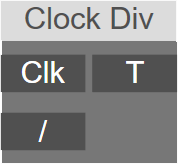 Outputs trigger signals at different clock intervals. The node sends out a trigger when the division of the value of the 'Clk' input and the value of the '/' input is integer. Used in conjunction with the 'Clock', 'Increment' or 'LFO' nodes rhytmic patterns can be created. /: Integer divider value (the value received here is always considered an integer).